Nowadays, when I photograph a recipe for the blog, I’m usually trying out a new dish to satisfy a craving or to try to learn something. I mean, I’ve been cooking for the blog for three and a half years now, posting an Eats post almost every week. I don’t have that many tricks I could keep to myself. That said... 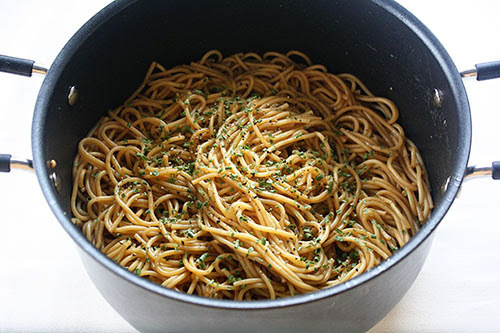 I did a double-take when I went through my archives recently, because I couldn’t believe I’d never told you about these garlic noodles that I make all the time. I have no idea why I kept them a secret – perhaps because I’ve been making them way longer than I’ve been writing here, and I guess I just forgot they’d be new to anyone else! They’re so much tastier (and well, you’ll see why) than basic white rice and can accompany pretty much any Asian-inspired main dish or veggies. A longtime fave! While the noodles are boiling, you can make most of the sauce. 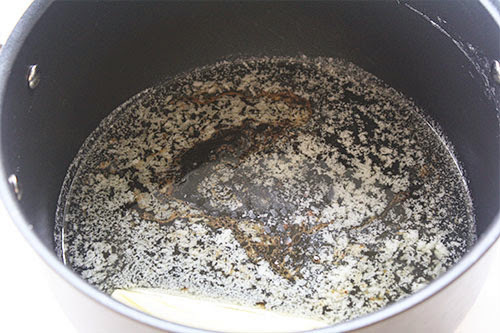 I’ve changed it up a tiny bit from the source over the years, and instead I use a quarter-cup each of brown sugar and soy sauce, plus half a tablespoon of garlic powder and a few dashes of fish sauce. You could use garlic cloves and chop them up yourself instead, or use pre-minced garlic; I prefer the powder to get the flavor of garlic evenly distributed, without having chunks of garlic floating around and sinking to the bottom. And stir it up! 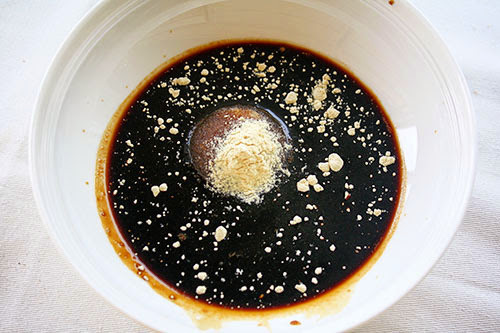 You might not get the brown sugar to entirely dissolve in that volume of soy sauce, but that’s fine. Just scrape it all in later. Now, as for the rest of the sauce... well... it’s butter. An entire stick of butter. I told you these were delicious! 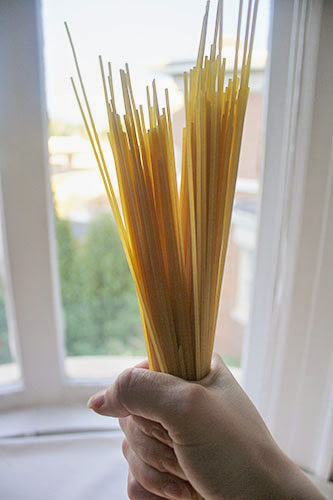 I admit I have used less butter in the past – cutting it down to 6 or even 4 tablespoons for a pound of pasta. But... this way is better. Let’s just go with it. 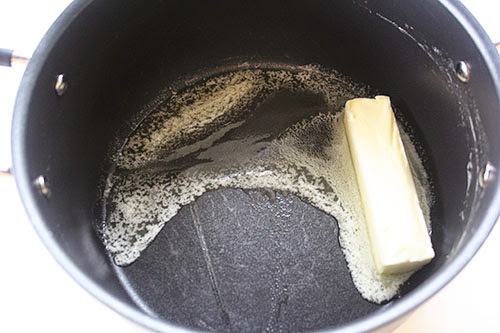 Add the brown sugar and soy sauce mixture to the butter and let it all melt together over low heat. Then toss in the cooked, drained noodles and give it a taste! I usually stir in dried green onions and a bit of pepper (either ground black pepper or red pepper flakes, depending on my mood and what I’m serving it with). Just season it as you like it. I mean come on... it’s butter and sugar and salty deliciousness. You can’t go wrong, really. I can’t promise that it’s healthier than anything you’d get for takeout – it might even be worse, hmm – but at least it’s easy and cheap and just as tasty! This time, I served these with teriyaki pork steaks (pan-fried, not as pretty as when Mr. P grills) and steamed veggies on the side. 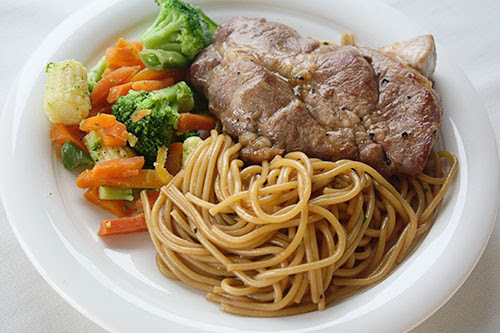 But sometimes I stir in veggies or meat to make it a one-dish meal, or eat them plain by themselves! They’re tasty no matter what... and that’s why they’ve been a menu staple of mine for a long time. Enjoy! Saw this version and thought of you: http://debsperfectbite.com/2015/02/21/japanese-garlic-noodles/.